The location seems to have turned out to be a stroke of genius (particularly with the demise of McGill Hotdog) – Square Victoria is now littered with people shoving burgers, hotdogs and fries into their mouths during lunch hour and it is not uncommon to see people lined up outside the restaurant waiting like crack fiends. And let me emphasize the waiting. I can be sympathetic with a busy restaurant falling behind but this is a whole other story. Our visit on a busy Friday lunch hour took 20 mins to get in and out of the restaurant to get 2 bacon cheeseburgers and fries. As two people who don’t fetishize the brand or fast food – this was annoying for us. What is fast food if it’s not fast? What I’m left to conclude is that this is about more than just the food – there is connection between their customers and the brand that keeps people waiting patiently for their burgers. Five Guys has done some interesting stuff to differentiate themselves from the plethora of other burger joints out there. Overall our bacon cheeseburgers were pretty good. As you may have noticed this burger isn’t winning any beauty contests but it gets the job done. I can’t say that the burger made me feel anything special but I can say it beats McDonalds/A&W etc. 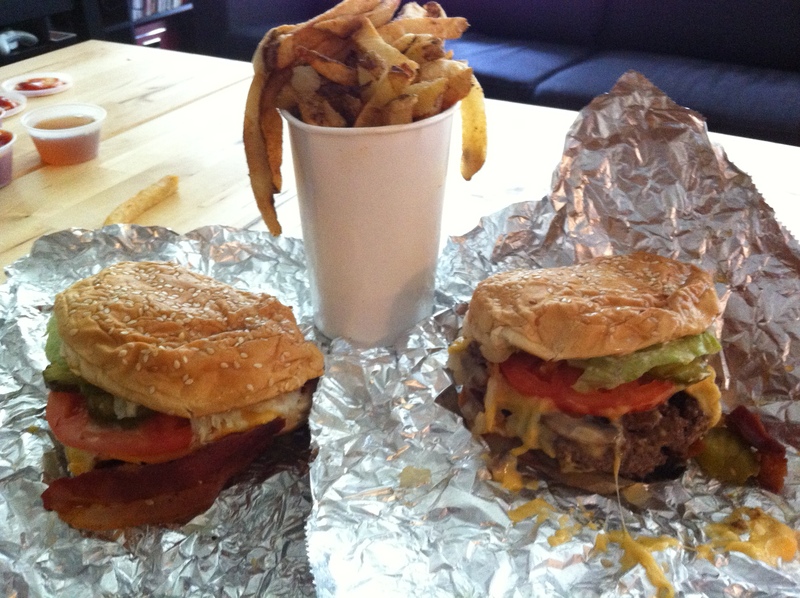 The fries come in Five Guys style or Cajun style – We ordered Five guys style and were not blown away. 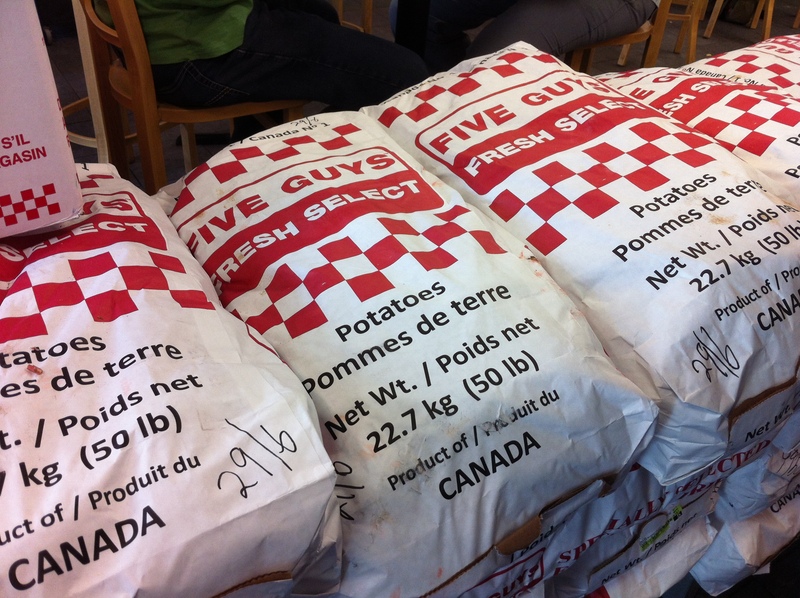 They put a lot of emphasis on the sourcing of potatoes but we couldn’t taste it and found the fries on the soft side. If you’re in the old port and want “fast” food – it’s not a bad option – maybe there is something in the double decker burgers that is getting people hooked. I feel the aesthetic of this place is perfect for a classic vanilla/chocolate/strawberry milkshake on the menu – unfortunately all they have is gigantic sodas. If anyone knows a good place to get a milkshake in Old Montreal – let us know! Tags: Bacon, Burgers, Cheap Eats, Cheeseburger, Fast Food, Five Guys, Fries, Greasy Spoon, Montreal, Street Food.